At Brookfield, daily maths lessons follow the National Curriculum and are also taught linked with other subjects, such as science, computing and geography. 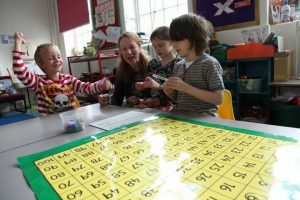 We feel that it’s important that maths is seen not just as a discrete subject, but something that children must expect to use on a daily basis for real-life purposes. Brookfield teachers aim to strike a balance between teaching calculation methods, which are taught in line with the school’s Calculation Policy (PDF) and teaching problem solving skills, encouraging children to apply their calculation skills and mathematical knowledge to games, investigations and puzzles. Maths work in class, where appropriate, is differentiated, allowing children to complete work at a challenge level which stretches them. Additional support is provided for those children who find areas of their year group’s expectations challenging, whilst ‘Greater Depth’ activities are provided for those children who are secure in their year group’s expectations. The school is currently working collaboratively with other Camden schools and the National Centre for Excellence in Teaching Mathematics (NCETM) in implementing a ‘Mastery’ approach to teaching mathematics. This has been influenced by the high performing models of teaching mathematics in Shanghai and Singapore. We have been running Parent and Carer (PAC) Maths sessions for a few years. This is a chance for parents and carers of Years 1 to 4 children every term to come into school and play games and help their children to learn maths, in a 45 minute session delivered by the year group’s teachers. We have received very positive feedback from adults who attend the sessions, as they are great for the school community, as well as the children’s learning. At Brookfield we consider being fluent in timetables a critical part of being a confident mathematician, and promote fluency in timetables through the school’s ‘X Factor TImestables’ system. Children can earn bronze, silver or gold stickers, by demonstrating their confidence in learning timetables in order, out of order and through division facts respectively. We are also taking part in a Camden ‘Spring Slam’ timetables competition for Years 3 to 6. By the end of Year Four children are expected to be fluent in all timetables from 2x to 12x. Additionally the school aims to support a greater appreciation of Maths amongst children through a range of initiatives, workshops and competitions, including Maths ‘Master classes’ for selected Year Five children in collaboration with the Royal Institution, workshops and special lessons in partnership with local independent schools, recently including The Hall and Highgate School, Maths Weeks, and The Camden Primary Maths Challenge.